David Rubio is currently an Honor Roll Junior majoring in Dance at Philadelphia High School for Creative & Performing Arts, studying under CAPA Head Legend, Ms. LaDeva M. Davis. David started dancing when he was 5, studying Break dancing and Acrobatics. At the same time, he began studying Capoeira, a Brazilian martial art that combines elements of dance. He has taken many Modern Dance workshops at CHI Movement Arts Center with a variety of teachers. He studied Flamenco with his mother, Anna Rubio, and in workshops with La Chiqui de Jerez, Antonio Hidalgo and Miguel Vargas. At the age of 8, he performed with the Body Vox Dance Company at Annenberg Center in their piece A Thousand Little Cities. In December 2013, he performed as a guest artist with Brian Sanders’ Dance Company Junk, during their two-week run of Snowball at The Annenberg Center. 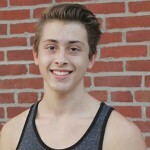 David is in his fourth year studying on full scholarship at the Gwendolyn Bye Dance Center, and in his third year dancing in Gwendolyn Bye’s Dance Fusion’s junior company Fusion2. He spent two summers training on scholarship at the Earl Mosley Institute of the Arts in Connecticut, where he performed pieces by Rennie Harris, Meredith Rainey, Earl Mosley and Crystal Brown. David was born in Spain and holds dual citizenship.